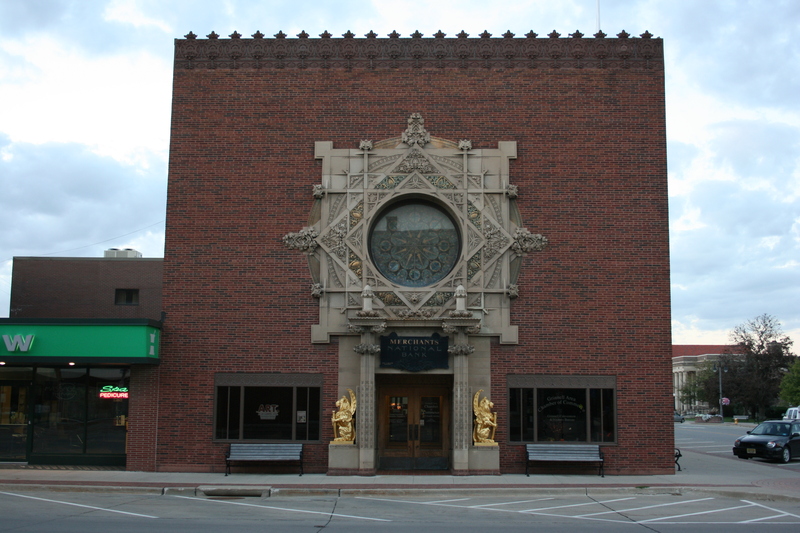 Louis Sullivan in Iowa | ride. travel. live. Three of the architect’s structures lie just a few miles off of I-80, so I paid them a visit on my drive west from Chicago to Omaha. These were all built late in his career, during one of the darkest periods of his life. 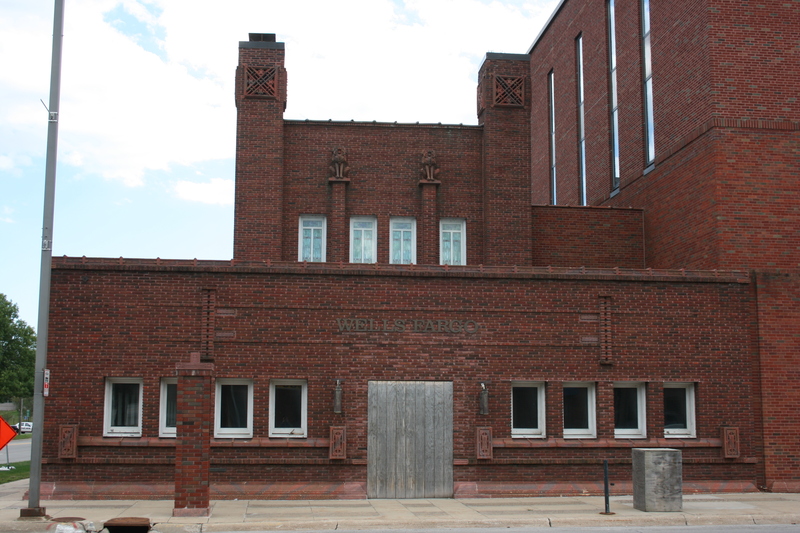 Despite his difficult personal and financial circumstances at the time, Sullivan’s creativity remained undimmed, and these buildings are hallmarks of one of America’s most original architects. I crossed the Mississippi River into Clinton, Iowa, a sleepy Midwestern town barricaded behind a levee. 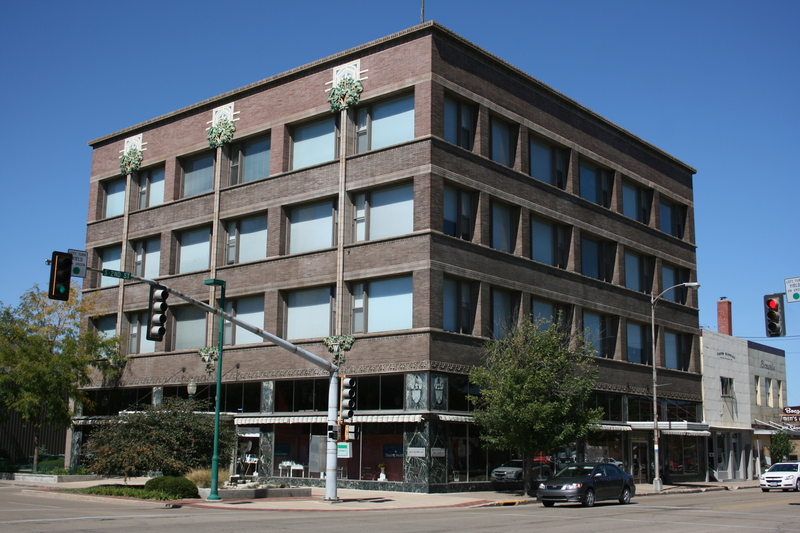 Sullivan’s building, the former Van Allen Department Store, the most prominent structure in the city, is located at the main crossroads of the town. 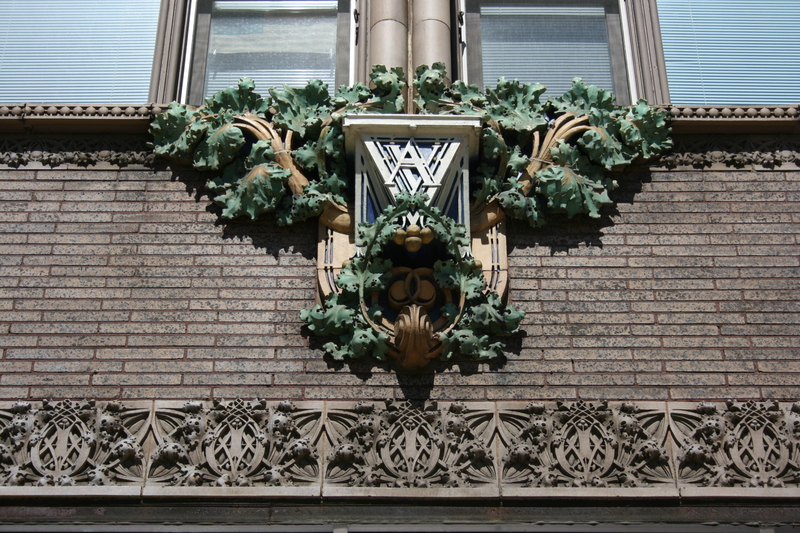 It is reminiscent of the Gage Group in Chicago, with a nice balance of horizontal elements in the large Chicago windows, and these ‘vines’ that rise between the windows and blossom at the top. The next stop was Cedar Rapids, to visit the now closed, still heavily damaged People’s Savings Bank, located on the bank of the Cedar River opposite downtown. The great flood of 2008 partially submerged the structure, and it’s still boarded up, so it’s in desperate need of restoration. It’s a very understated building, with no multicolor decoration or organic motifs, but with subtle shades of brick red and smaller decorative elements that require a up close look. 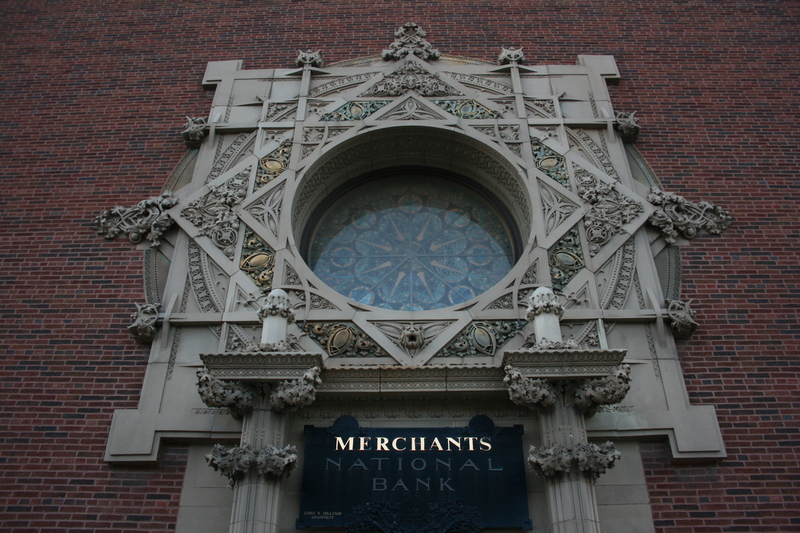 My final stop was the Merchants National Bank in Grinnell, IA. 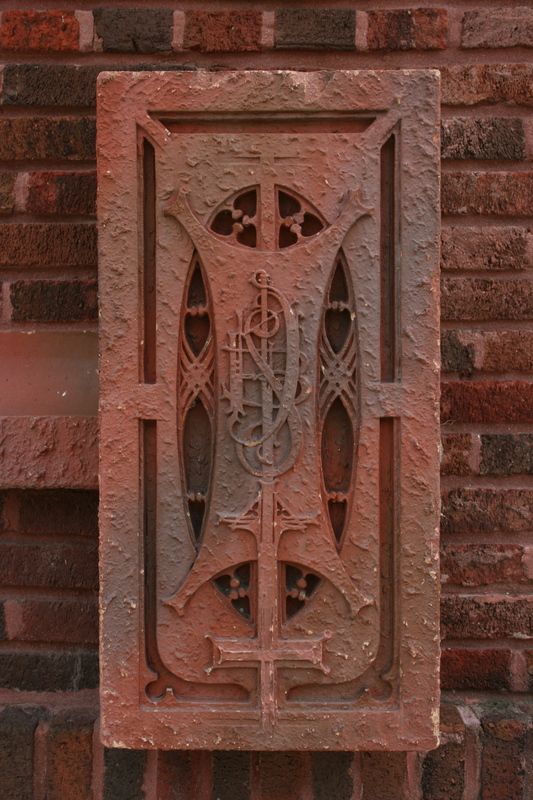 This is a building marked by a rather plain brick facade offset by a very exuberant cartouche above the main entrance. It’s the largest building on the block, sited at a corner, with a solid, but not out-of-scale presence. Sullivan was quite sensitive to the scale of the building and its surroundings, so one gets the impression that this is the dominant structure, while being harmonious with the other buildings nearby. 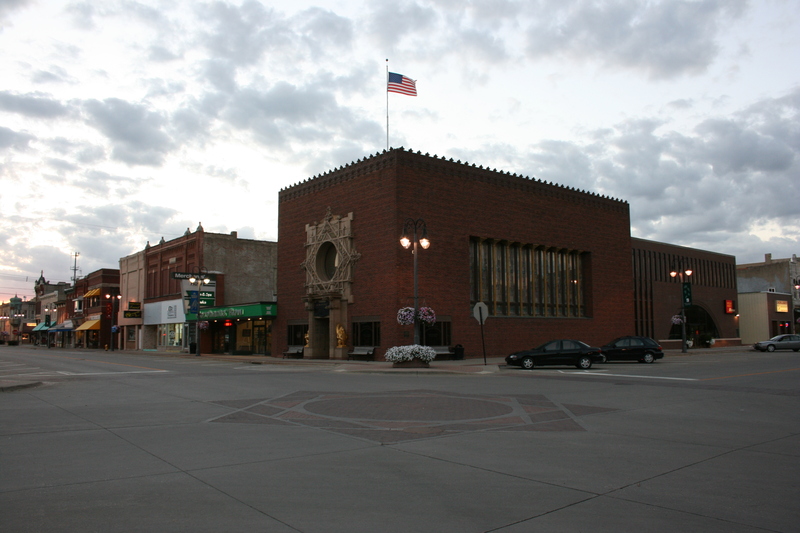 He has an additional building in northern Iowa, in Algona, which I did not have the chance to visit.